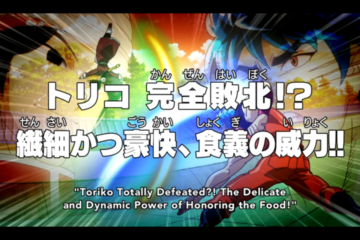 Anime Reviews: Toriko Episode 102 – Toriko Finally Defeated?! The Delicate and Dynamic Power of Honoring the Food! Anime Reviews: Toriko Episode 101 – People Without Gratitude Aren’t Welcome! Terrifying Chowlin Temple! 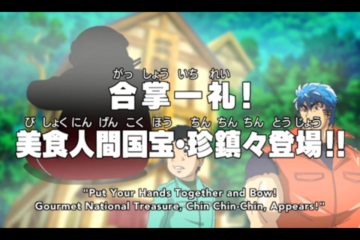 Anime Reviews: Toriko Episode 100 – Put Your Hands Together and Bow! National Treasure, Chin-Chin, Appears! Anime Reviews: Toriko Episode 099 – Too Huge! The Giant Fortune Roll, Completed With a Pro Wrestling Move! Anime Reviews: Toriko Episode 098 – Toriko Faints in Agony! Capture the World’s Stinkiest Ingredient!